...powerful aliens who positioned themselves as gods on Earth thousands of years ago. ...a race of Atlantean oracles who foresaw a desolate future dominated by an incomprehensible alien race. ...genetically augmented transhumans, doomed to die fighting to save a world that turns its back on them. ...a star-spanning alien blight that slowly and insidiously conquers planet after planet. ...and the slim yet powerful hope of man's eventual triumph over them all. 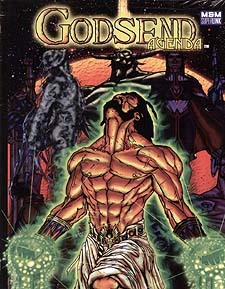 The GODSEND Agenda is not your typical game of costumes and superpowers. It looks at super humans and how they affect the world around them. It also deals with how our culture worships them, now and in times past. GODSEND Agenda offers players chances to not only interact with those legendary celestial beings, but to walk among them as equals. * Six thoroughly explored factions and alien races: The Angelos, Atlanteans, Black October, Chimerans, Elohim, and U.S.E.R.